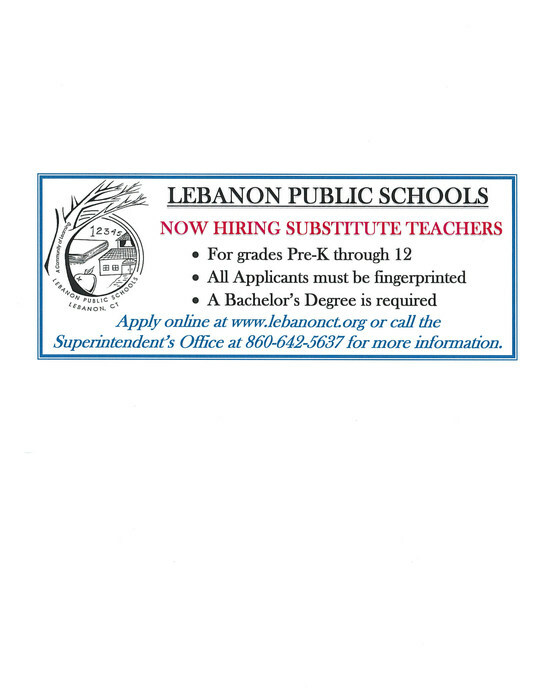 The Lebanon School District is always hiring for substitute teachers. Please see the flyer below for more details. Due to a lack of RSVP's, the post-secondary transition night on March 27, 2019, has been cancelled. It's never too early to start planning your child'd post-school/ adult services options. Come on March 27, 2019 from 6:30 p.m. to 7:30 p.m. to learn more from a panel of community providers. See the flyer for more specific information. The Communications/SP/Goals Subcommittee Meeting and Curriculum Subcommittee Meeting scheduled for Tuesday, March 12th have been cancelled. The Board of Ed Meetings scheduled for Tuesday, February 12th have been cancelled. They have been rescheduled for Wednesday, February 13th. Friendly Reminder - There will be a BOE Budget Input Session for the public tonight at 7:00 p.m. in the LMHS Auditorium. All community members are encouraged to attend! There will be a BOE Budget Input Session held on Wednesday, January 16th at 7:00 p.m. in the LMHS Auditorium. All community members are encouraged to attend! Lyman Memorial High School Open House on Thursday, December 6, 2018. The Agriscience Center and Holiday Bazaar will open as well! LMS PTO Meeting Wednesday, October 10th 6:30pm in the Library (childcare available) We will be discussing the upcoming Haunted Trail so if you'd like to help please come! Our meeting will be 1 hour and a quick walk thru of the trail and gym set up! See agenda for full meeting outline. Help our middle school raise money just by shopping! Register your card online today! Instructions Below. CORRECTION!! Open House is at 6:30 tomorrow evening at the Middle School. My apologies! The PSAT will take place during the school day on Wednesday, October 10th at Lyman Memorial High School. Sophomore and Juniors- you are already pre-registered to take this test at no charge. If you have questions, concerns, or know you will be absent that day, please see your Counselor. Freshmen: If you are interested in taking the PSAT, please come to the Guidance Office to sign up. Available spaces are on a first-come, first-serve basis. The cost is $17 and checks can be made payable to "Lyman Memorial High School." Registration closes on September 26th. Parents - It is that time of year again when we will be holding our annual picture day at Lyman Memorial High School. This photograph has many useful applications for our school, as well as your personal portraits and memories. Prestige Portraits - a division of Lifetouch Studios - has mailed to each underclassmen parent a white envelope with the words, "Important School Picture Day Information Enclosed" in blue on the outside of the envelope. This envelope has enclosed your ordering materials for those of you who wish to purchase. If you did not receive this envelope or misplaced it, we have extra forms in the main office. If you have any questions, regarding your order, please call Prestige Portraits at 800-426-9533 ext 117. All underclassmen parents who order their portrait package online will receive a free 8x8" 20-page, full-color, hardcover memory book from Prestige's Shutterfly division. Our picture date is Tuesday, Sept. 11. Good Morning Everyone! This is a friendly reminder that Chromebook Insurance payment is due by, Monday September 17th. Please send in an envelope with your child's name on it. Cash or checks can be made out to Lebanon Public Schools. Thank you and have a great day! While this presentation is targeted to parents of seniors, all interested parents of students in grades K-12 are invited to attend to learn more about recommended strategies and insights on college funding. Come and Join the PTO! See attached! Picture Day Tuesday, September 18th! See order form and flyer attached! The first day of school is August 29th! Welcome to Lebanon Public Schools!